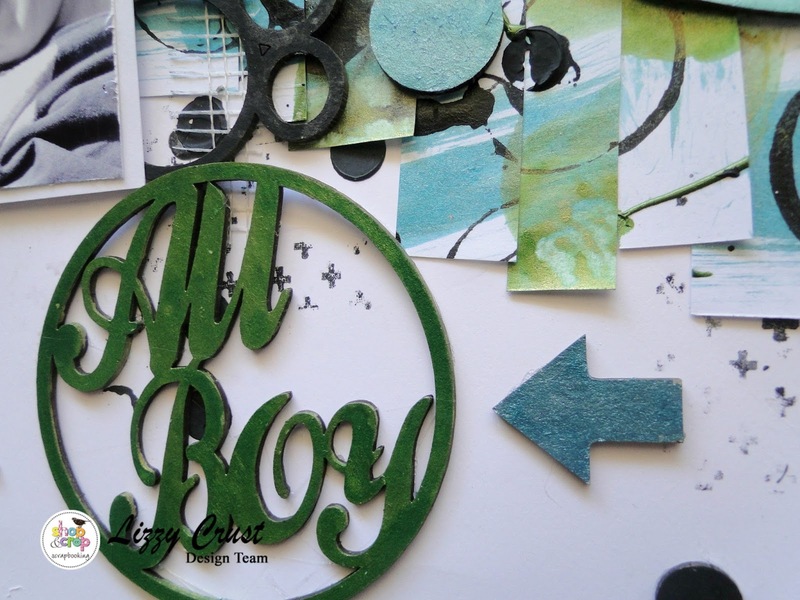 Shop and Crop: Mixed Media Kit - ALL BOY and August Challenge Tic Tac Toe! 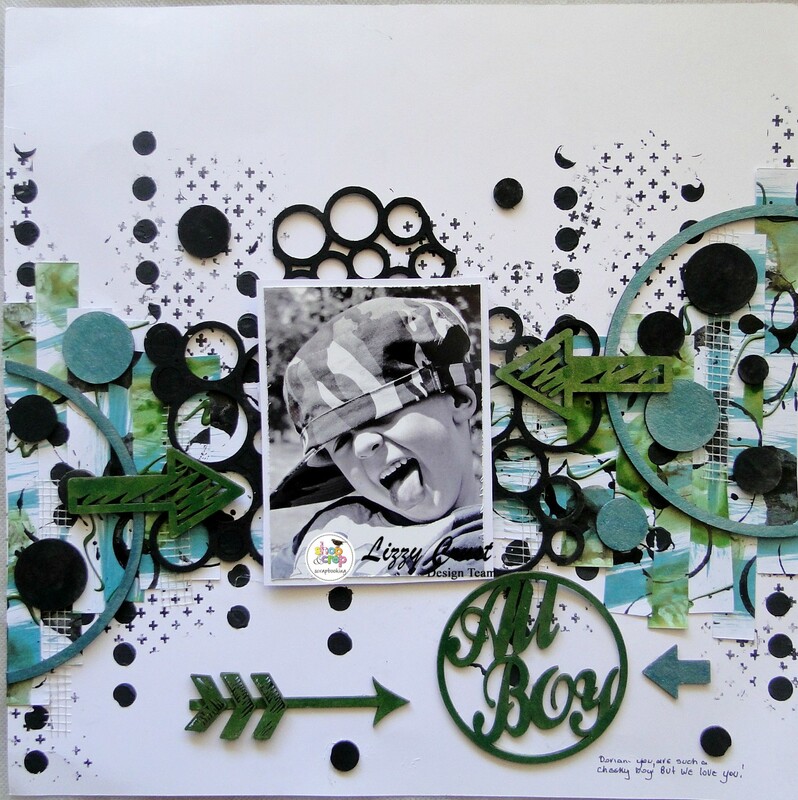 Mixed Media Kit - ALL BOY and August Challenge Tic Tac Toe! Here we are in the 8th month and August is flying by... I hope the cooler days have meant some inside scrapping time with your SHOP AND CROP KITS which are ready when you are to do some creating!! I was sent a fabulous Mixed Media Kit/ Expo Kit no2 which is just perfect for your little man with products that are such fun to use. 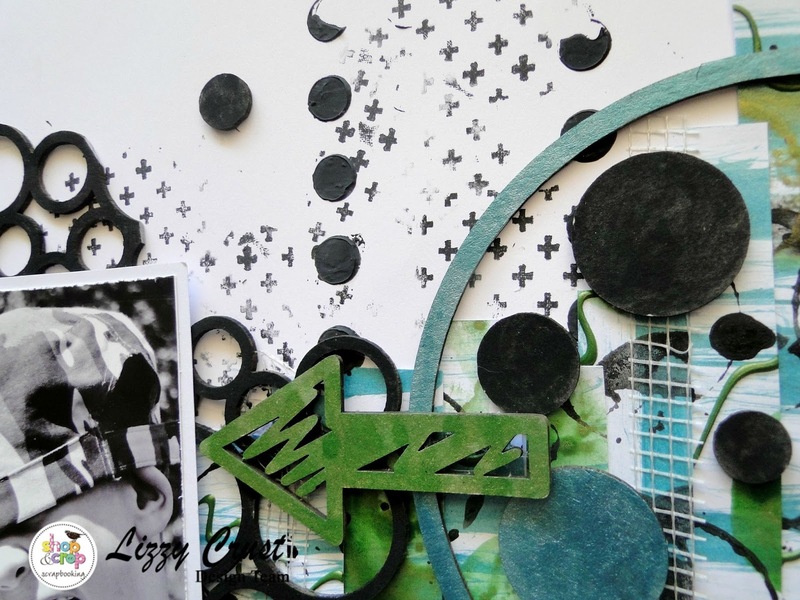 This gorgeous layout was created by the talented Elisa Ablett. 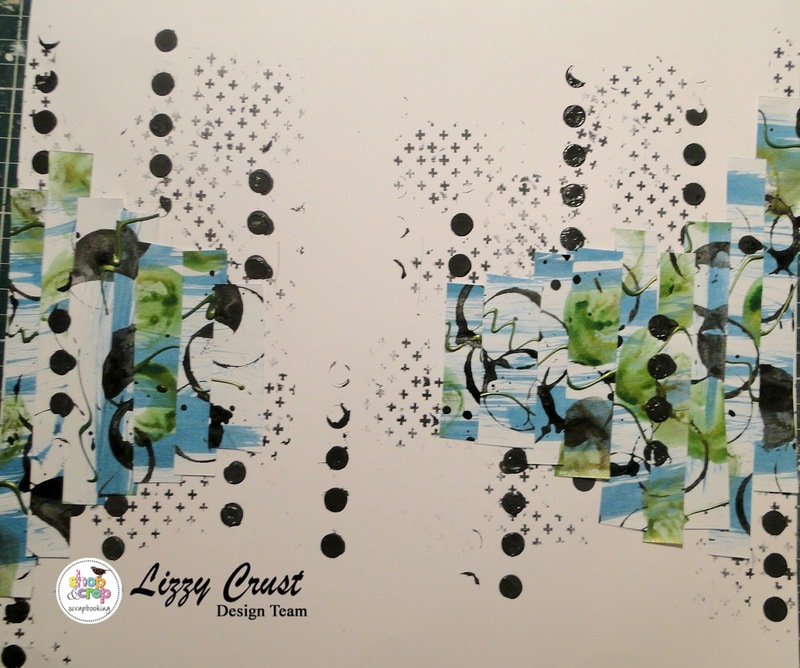 As I created with this kit, I thought I would also share the instructions with you to show you some other ways you can create with this fun kit. I started by finding a photo which I cut down from 10by15cm to 8by11cm but you can use a 10by15cm photo if you like. 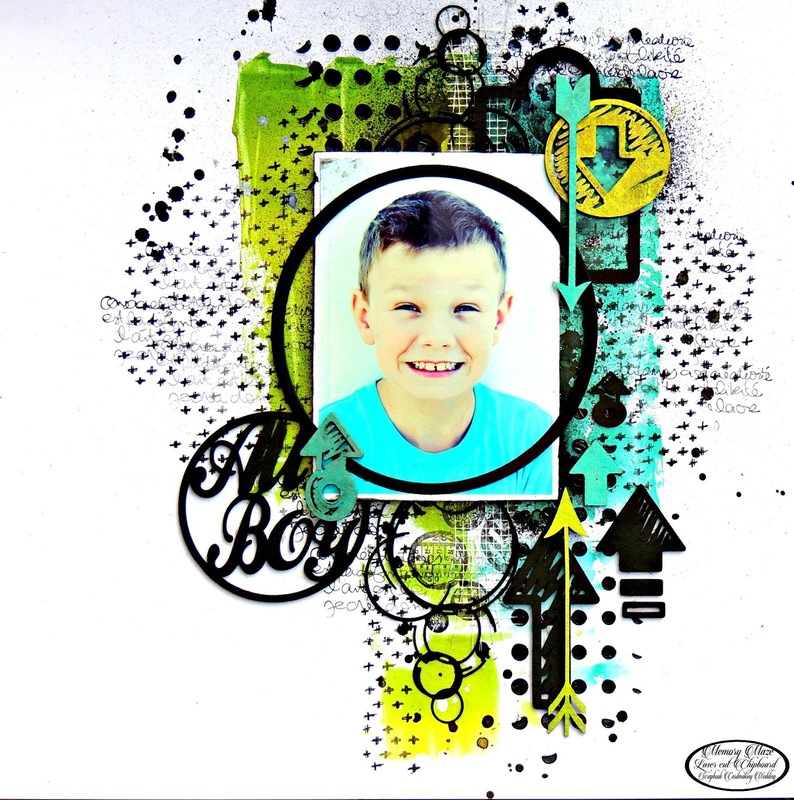 I distressed the edges of the photo and matt it on the smaller white paper in the kit. I also used some old cardboard to add some dimension/lift to the photo, foam tape or foam dots would work too.With that left over paper that you cut a piece out of for your photo matt we are going to add some color to that to use on our layout. 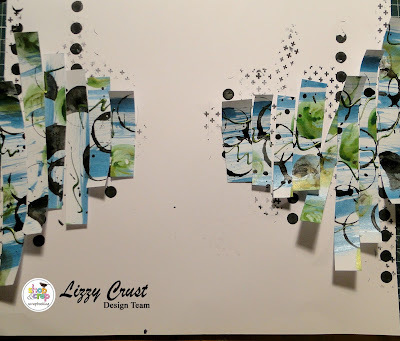 Using the mixed media products from the kit we are going to create a random pattern on the paper.. 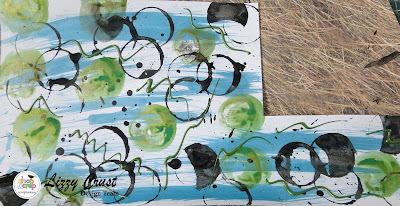 I dropped some Teal color in drops on the paper and then swiped it across my page with an old toothbrush. 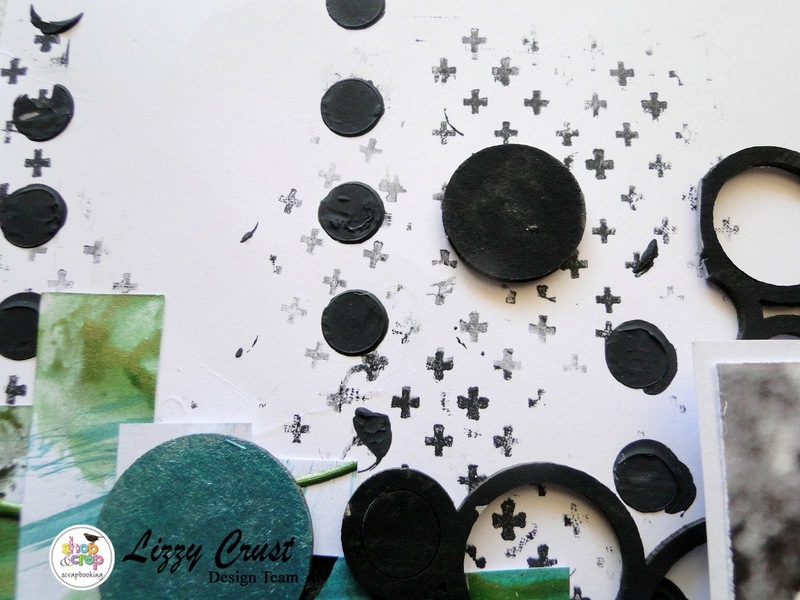 I then watered down some black gesso and used a lid from an empty washing liquid bottle and stamped the black gesso using both ends making messy dots and circles. I also made some splats and drops with the black gesso - the messier the better I think!! I let all this dry and then I made some wriggly lines with the green paint and then watered down some of the green and used the base of the lid to stamp some circles and let this all dry.. This is what my paper looked like.. There are no rules for this, just use what you have on hand and have fun!! Meanwhile as the paper dried I took an assortment of chipboard and painted them with the black gesso, the watered down green paint and Teal paint..
Set these side to dry while we begin to add some stamping and stencilling to the base cardstock for our layout. 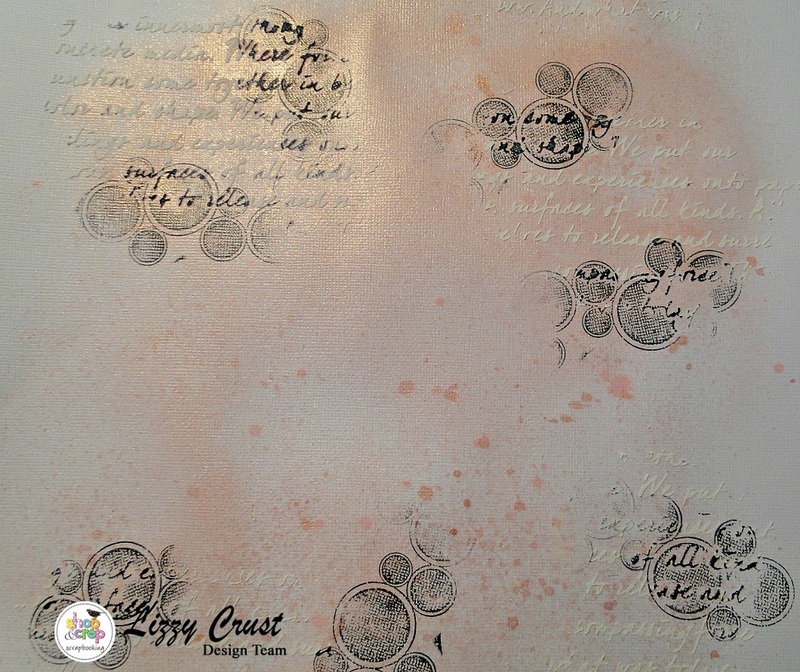 With the stamp, I took the stamp to the ink pad and randomly stamped on my page.. If you dont mount the stamp on the acrylic block it will have an arty look rather than a square look on the back ground.. 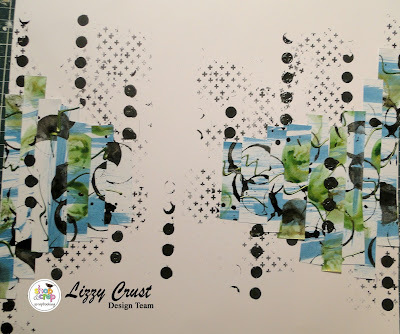 I added some texture paste to some black gesso and added some dots on the back ground using the stencil from the kit. 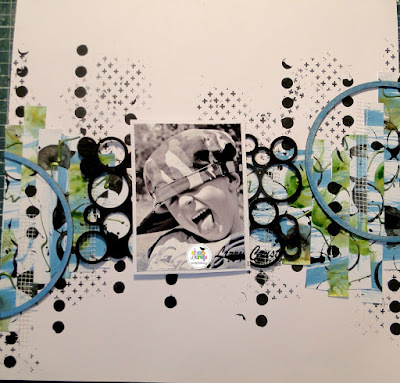 It is always better to do less at the start, you can always add more later.. (which I did!!) 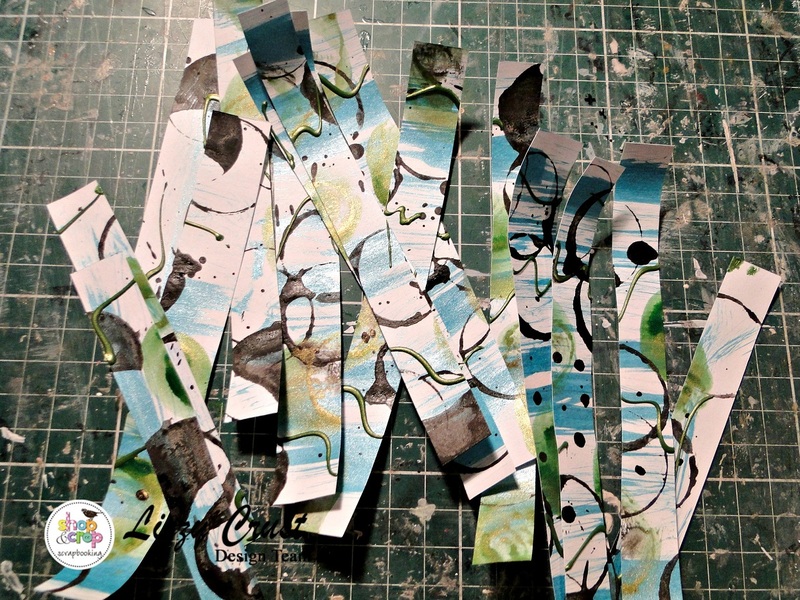 And remember to clean your stamps and stencil immediately after use with a baby wipe. 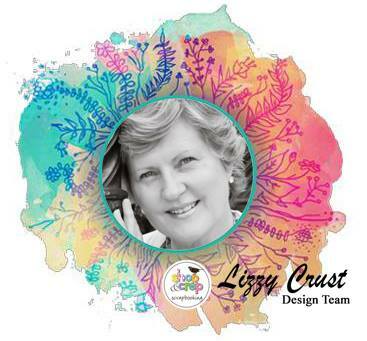 I planned to place my photo in the middle section of my page.. but you can also put the photo to one side slightly more if you like.. that works well too.. Going back to the paper we painted, cut out strips about 1cm wide, but dont measure and it doesn't matter if some are a bit fatter than others..
(OOO excuse my dirty scrapping mat!!!!) This is what they will look like! 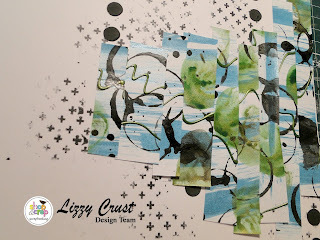 Take your base and lay the strips on your page until you are happy with how they look..you may cut some to have the different lengths, overlapping the edges slightly! Using a good glue adhesive glue down the paper strips..
At this point I decided to add some more stamping and some more stencilled dots. Now back to the chipboard!! 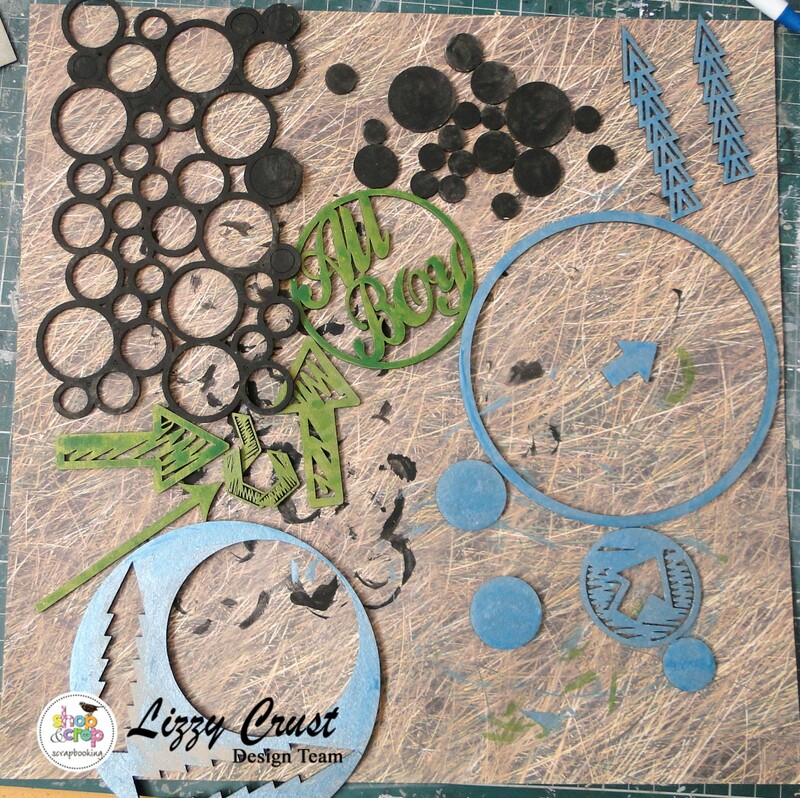 Take the circle which I painted with the teal and cut it into two pieces with one piece just a bit bigger than the other. 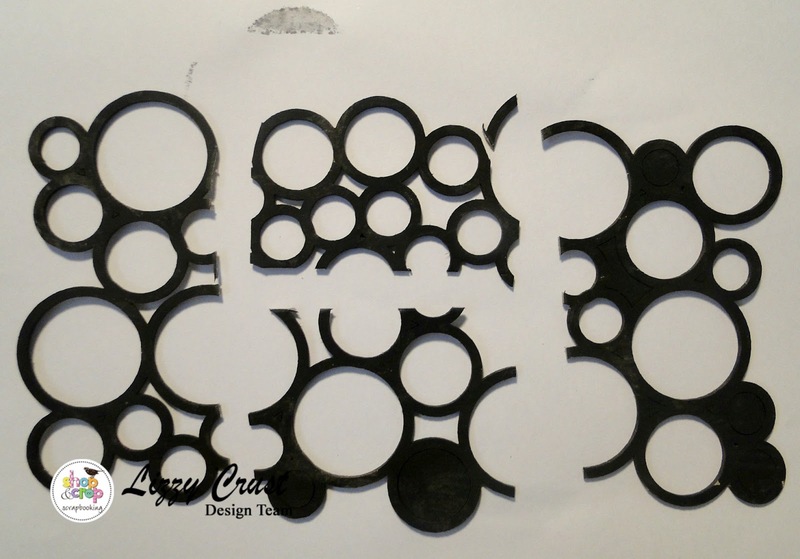 Cut the circle chipboard into pieces as shown. Cut 10cms of the mesh and cut 4 strips from that and place randomly on the paper strips on your back ground. 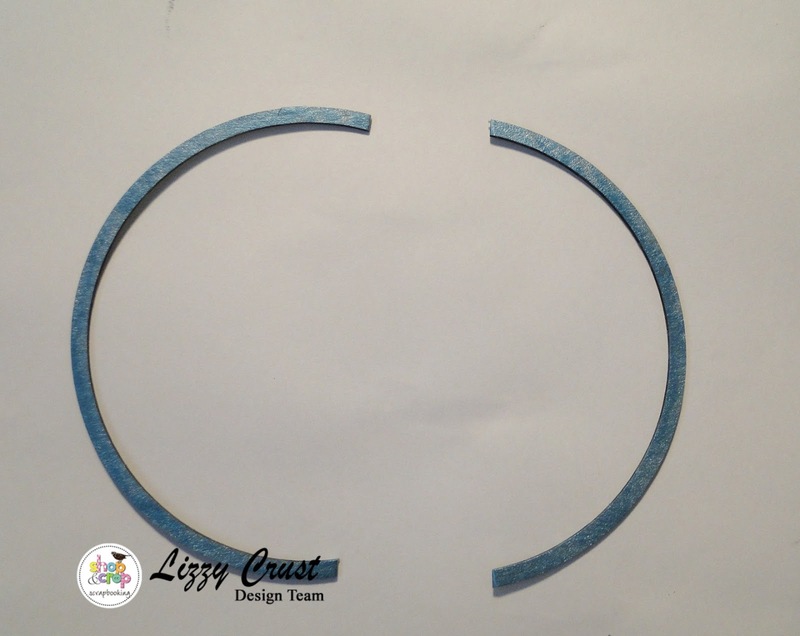 Now we will assemble the layout!! Place one circle piece on each side, with the slightly larger circle piece on the right side, and the larger circle chipboard pieces on either side of the photo with a smaller piece on top of the photo. 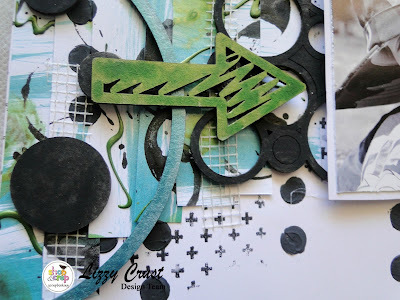 Using the chipboard pieces that were previously painted place on your page layering the arrows and adding a little journalling in a space about your photo.. 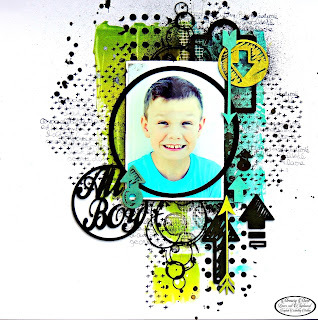 Such a fun kit and such a fun page for a photo of your little man!! 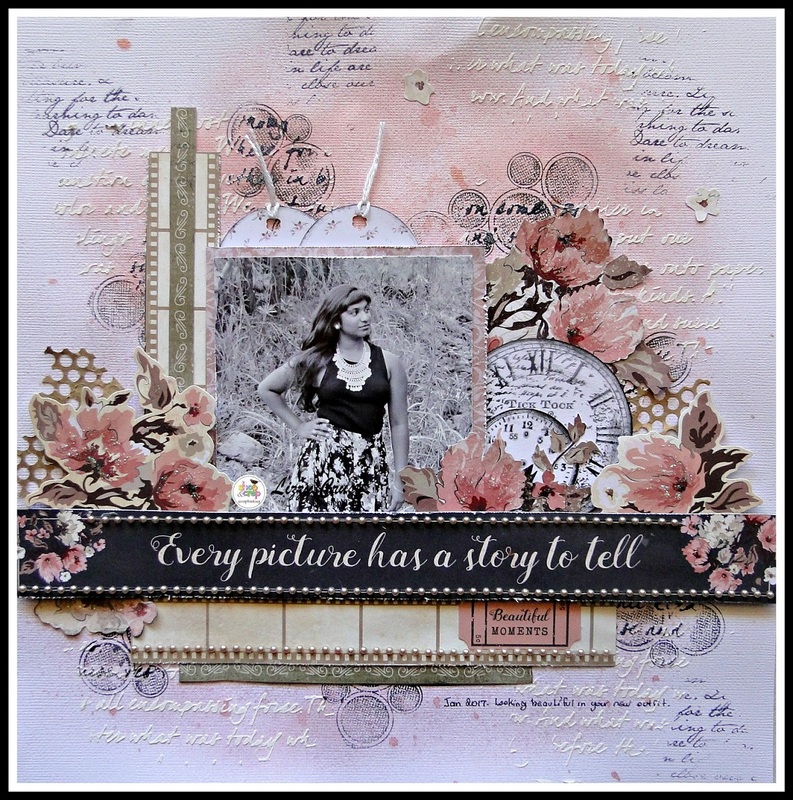 You can get this kit in the Store HERE!!! 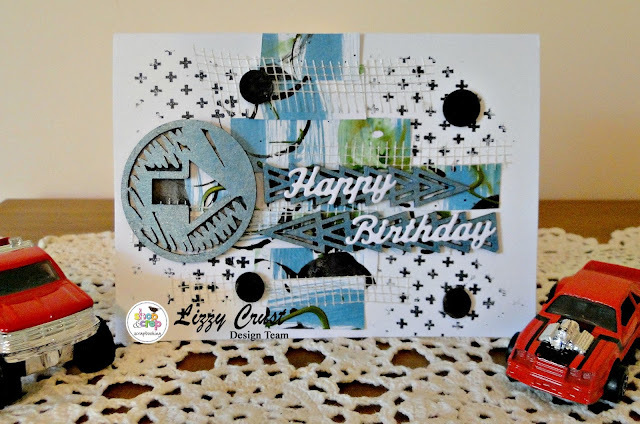 Oh and there were a few chipboard pieces and paper strips that I painted and didnt use so those leftovers were used to make a card adding some stamping and mesh strips. And have you seen this months challenge for Shop and Crop Scrapbooking on the BLOG??? 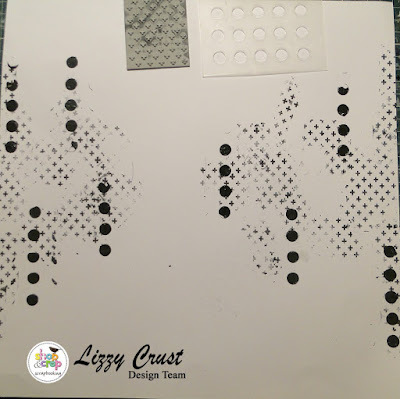 It is a fantastic Tic Tac Toe that looks like..
You can choose three things to use in a straight line and I chose to use the middle line, Stencil Cardstock and Ink.. 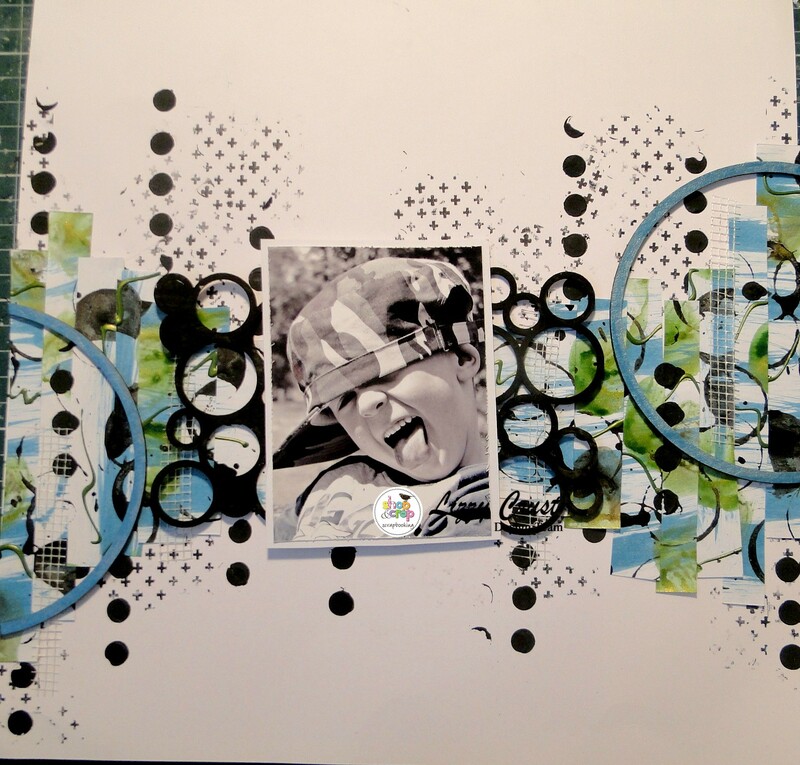 The back ground using stamps and ink and a stencil and texture paste. I also sprayed a little mist on the back ground too..
You can put your layout up on the Facebook page HERE!!! 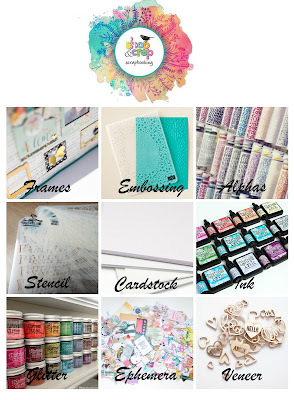 Thank you for reading this long post, I hope you have found some fresh inspiration to use in your creating..
You can find that fabulous kit in the shop HERE!!! 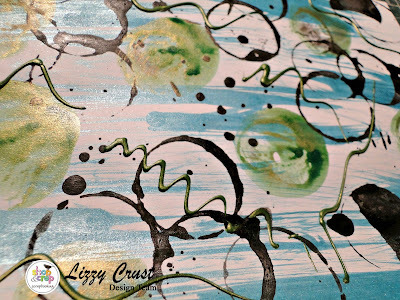 dont forget to use the code LC5 for a $5.00 discount!! 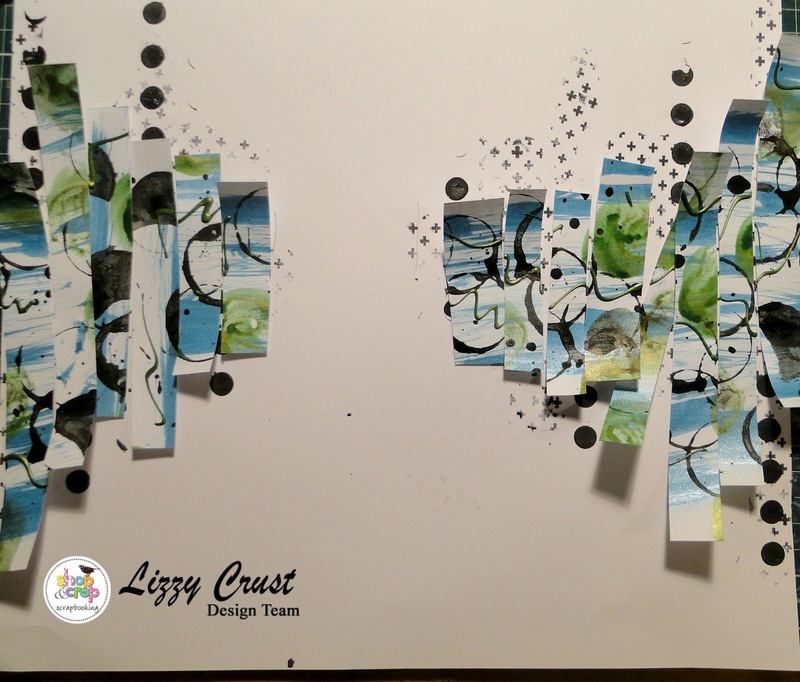 Until next time.. happy creating!